The first harvest from my rooftop container garden was an underwhelming 5.6 ounces of snow peas. They were very good, but I'm not sure if I personally like them enough to continue growing them. Something to think about. Anyway, last year I decided I was going to record what my garden produces and compare it to what I would pay for the equivalent amount if I bought it at the Union Square Greenmarket. My hope is that the market value of the total harvest will exceed the total money spent, which right now is $201.90. Do you think I'll be able to make back all my money? Even if I don't it won't stop me from gardening! 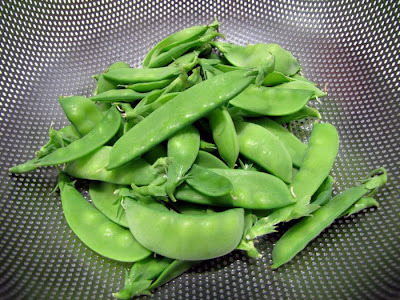 *Nobody at the greenmarket was selling snow peas so I went to 4 different supermarkets and averaged their prices. Also, none of the supermarkets were selling organically grown snow peas so I was stuck with the conventionally grown prices, oh well. I had a pretty pitiful harvest this year, too. I tried to keep track of how much money I spent. But soil and planters cost way way more than I'm comfortable admitting. Maybe I'll get my money back in 10 years. Hi Erin, I spent a lot last year just to get started. It's part of the reason I'm keeping track of my expenses this year. I'm hoping it will prevent me from buying unnecessary gadgets. Gardening is an investment that pays off in years. Experience, better soil, techniques that save time, money, and your plants are hard to quantify payoffs. Highly doubting you can earn your money back this year, but you will over several. Snow peas -we've been lucky this year with the cooler weather- need a row to produce usefully. A few plants make snacks, a row makes a meal. Cool air makes them sweeter as well. HoW many edible plants do you have and what varieties did you plant? Also, how big is your family? If you planted vegetables that are expensive, a lot of vegetables, or you have 4+ people in your family it will be easy to produce more than $200 in produce. I'm not thinking about my expenses this year, since it's my first year of real gardening and I've had a lot of one-time expenses (tools, grow light, etc). It'll be interesting to see if I can break even next year, though. That's a great experiment. I'll be following to see what your tally is. I never weigh harvest before... It will be a great idea to do so... I may start with winged beans, which will bloom soon. Hi Everybody, I'm happy this is generating a lot of interest. I enjoy keeping records like this so it's great others like it too. I could have let the peas continue to grow to harvest a little more, but as the plants got larger I was having space issues and had to make a sacrifice. Guess who lost.